If there’s one thing about smoking cannabis that is guaranteed not come with unwanted side effects, then it has to be rolling. Satisfying, engaging and much more creative than ordering a 50/50 pizza instead of a margherita or the inevitable all day cartoon-fest, the art of rolling has almost as much potential to get someone hooked as the drug itself. 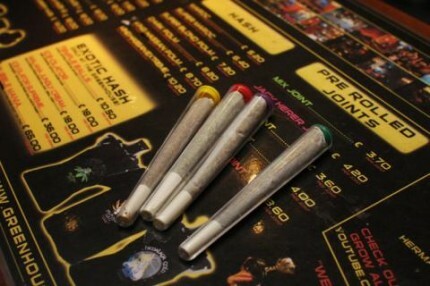 Interestingly, smokers from around the world seem to adopt different styles of rolling. While spending time working for Time Out Amsterdam, engaging in the privileged task of writing Coffee shop reviews courtesy of the expense account, I had a chance to observe these various techniques, as demonstrated by pot-smoking tourists burning time in the ‘global-village’. I wouldn’t like to comment on what it says about the various cultural identities, but it’s interesting all the same. Lets start with the Dutch style, well planned, serious, and big. Using the whole roach card to make a sturdy filter, notable for the folded Z-shape in the middle, these spliffs are chunky and coned. They are also filled with twice as much weed as you need, mixed with cigarette tobacco to help it burn longer. Any pre-rolled joint you will find in a Dutch coffeeshop is rolled like this and if you do get lucky and spot a Dutch person actually in one, then you’ll find them rolling theirs the very same way. You could say it’s a design classic. Quite the other end of the spectrum is the American style. A lot less tidy, and usually rolled with pure cannabis, there’s a reason they call them ‘doobs’. These often don’t even use roaches and instead are twisted up at each end like a sweet-wrapper. They resemble a kind of chubby slug rather than a cone. On the plus side they use up a lot more paper, but you end up wasting a fair amount of weed too as its pretty tricky to smoke it right down to the end with out burning your lips, or choking on the roach (Big Lebowski style). However, the purity does mean it’s fairer on your lungs. Then of course there’s the UK style, which is similar to the Dutch, as in it uses a roach and is coned, but they tend to be a lot thinner. Like a polite, respectable version of the Dutch one, in line with the Brits’ sensibilities. In the UK, smokers seem to prefer rolling tobacco instead of cigarette flakes, which makes it easier to roll thinly and neater. For the champagne smoker, blunts are the only way. These are thick, brown rolling papers made out of tobacco, and a lot pricier than king-skins as you only buy one or two in a pack. Of course, when in Amsterdam, tourists like to treat themselves, and you can buy blunt wraps in abundance at the various shops selling googly eyed cannabis paraphernalia about the city. These are quite a bit harder to roll, as the paper is less sticky. They are also probably the worst for your chest as it’s a bit like smoking a cigarette and a spliff at the same time. Not to mention that they are generally pretty damn big. Still, nothing beats a novelty smoke….cough….tulip!